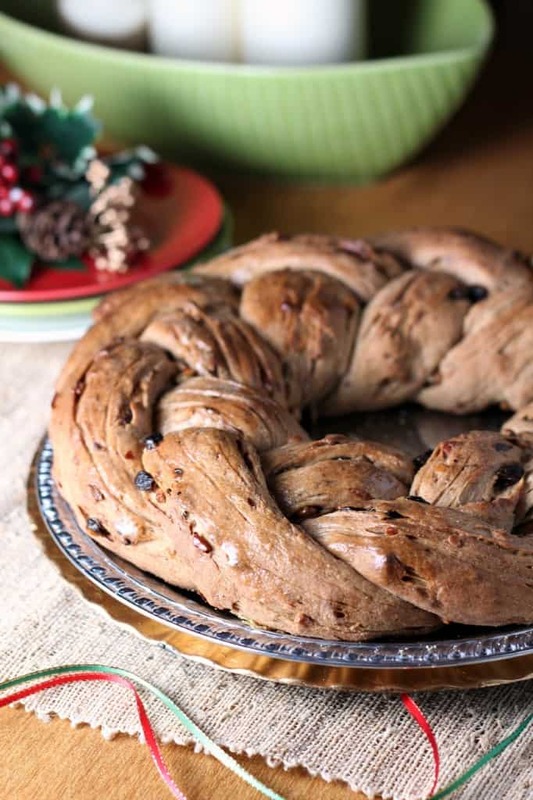 Add a festive touch to your holiday table with this stunning raisin and nut bread wreath. The technique of braiding the strands of dough is not as hard as you might think and the process creates an impressive visual effect. 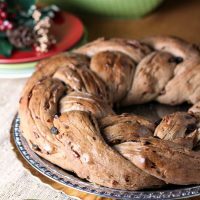 This raisin and nut wreath bread is a recipe from the website for The Telegraph, a newspaper published in the United Kingdom. I enjoy their food section and love the British take on holiday foods. Some traditions are similar to those in the U.S such as a roast turkey dinner with all the trimmings but others like Christmas pudding and fruitcake are stars on a British menu that are rarely given the same worth here. 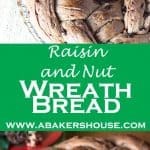 This wreath bread would impress on either side of the Atlantic without a doubt. It can be a centerpiece for your table and looks stunning with some greenery and a candle in the middle. Or serve it on a buffet with a small bowl of soft butter in the middle of the wreath so that the bread can be pulled off in small pieces then topped with butter or jam. Can I use a variety of nuts in this bread wreath? Use any type of nuts you’d like– pecans and walnuts would be nice– and switch out the raisins for dried cranberries or currants if you please. The #TwelveLoaves bakers are baking Holiday Breads this month. We’d love to see how you celebrate the season and welcome you to share breads from any holiday you cherish. Preheat the oven to 350 degrees F and toast the chopped nuts for 5-7 minutes or until they are fragrant. Meanwhile, cover the raisins with boiling water (add two Tablespoons of rum if you'd like) and allow them to plump for 15 minutes. Drain them and set aside. Bring the milk to a simmer in a saucepan over medium heat. Cut the butter into small cubes. Once a thin skin forms, remove from the heat and add the butter. Transfer to a large bowl and leave to cool for about 30 minutes. The mixture should feel warm to the touch but not burning hot. Add the yeast and stir to dissolve. In a medium sized bowl add the wheat flour, bread flour, sugar and salt. Whisk gently to combine. Pour the wet ingredients into a stand mixer. Add half of the dry ingredients then add the raisins and nuts. Stir with a spoon before adding the remaining dry ingredients. Mix thoroughly with a wooden spoon then put your dough hook onto the stand mixer and let the mixer knead the bread for 5-8 minutes or until the bread is smooth. Spray a clean bowl with baking spray then turn the dough ball in the bowl a few times to coat all sides. Cover with plastic wrap also coated in baking spray and let the dough rise for about 2 hours. Remove the dough from the bowl and divide into three pieces. Roll into sticks about 80cm (30in) long and 5cm (2in) wide. Start to braid, leaving the top end of your pieces unattached at first so that you can weave them into your braid as you complete the circle, forming the wreath shape. Transfer the wreath to a large baking-tray. Cover with a clean tea towel and leave for 45 to 55 minutes. Use a spray bottle to spritz the bread with water right after you put it in the oven and bake for 35 to 40 minutes. If it starts to brown too much, turn the temperature down to 325 degrees F. Five minutes before the end, brush with milk for a shiny glaze. Serve warm. Yes, this would make a GORGEOUS holiday centerpiece! What a beautiful braided loaf! Thanks, Liz! And thank you for all of your hard work this month making this group post fun to be part of! Gorgeous, gorgeous! I agree with Liz — this would be a beautiful centerpiece! 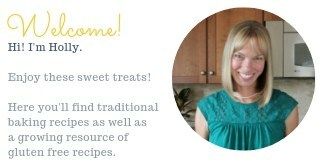 Thanks, Yvette, I may make another braided wreath to share with family on Christmas morning. There is something special about sharing bread and this wreath would be perfect for a holiday table. Gorgeous, Holly! Very pleased too to hear mention of The Telegraph. Although Tokyo is my hometown and has my heart ; but so does the UK! Thank you also for the how-to…One of my New Year’s resolutions is to make a braided bread! Beautiful loaf Holly! Your braid is stunning! I’m going to have to check out the Telegraph! Thanks, Karen, yes I like the food perspective in the Telegraph. Often I’ll notice my husband has conveniently left the computer open to a webpage with an English recipe hoping I’ll like the look of it and make it for him! I agree with all your other comments. This wreath is beautiful! Oh thanks, Karen. I have a long way to go learning about the dough and how to have the right mix of flours and hydration– the crust on this bread looked awfully dry but it still tasted good and inside was soft and tender. It’s fun experimenting! Such a gorgeous wreath bread, Holly! It is so elegant and lovely for a holiday centerpiece! I love to look at British recipes…and I always say I’ll try something new for the holidays and never get to to it;) Thank you for being a part of our Holiday Breads theme!! Wonderful looking bread right here! Walnuts are one of my favorite ingredients when baking bread — have you considered tossing in some walnut oil as well? I’ve used this a number of times in my sourdough and it lends a very rich and complex taste. Cant wait to try this out, thanks for the recipe! Thanks for the suggestion- I used walnut oil at a cooking class earlier this year and liked it in a salad dressing. Adding it to a bread dough didn’t occur to me and I look forward to trying it. Thanks!